When I was 14 my parents bought me a sewing machine because I did sewing at school. When I moved out of home at 18 and left it there for storage my Mum decided it was to be hers and I never got it back. Fast forward a few years and I decided I need a hobby and that I missed sewing, so my parents bought me a machine for Christmas. 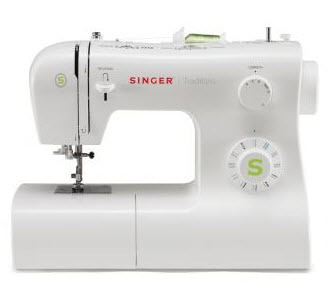 They bought me a Singer 2277 Tradition. It's entry level and at the moment, it is perfect. Mum is really crafty and has bags and bags of material and lots of little bits and pieces, so she let me raid her stash and I got some really beautiful vintage materials.. The only problem is that I am not sure if I would actually wear any of them, so I am trying to figure out how I can best use them. So far, I've made my Cousin's little girl a skirt and nappy cover (I forgot to take pics), a skirt for myself which I need to fix and a top for myself. The top was made using the Colette Sorbetto top (free) pattern. I used a black and white striped material which I bought for $10/m from Lincraft. I lengthened the pattern about 1inch because I like the length to be a little longer.. though, it is still too short for my liking. I am not really that brown.. I love photoshop! I love the top! For my first proper project, I am really proud of how it came out. I can't wait to make more! I am also looking to buy some dress patterns to make some nice summer dresses. Colette have some good ones, though I think I would prefer a few more casual dresses.